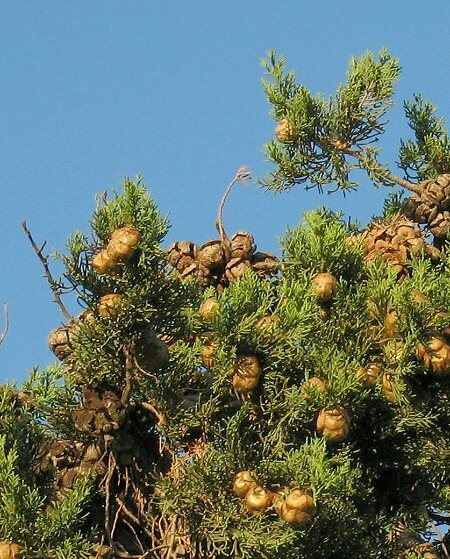 ﻿ Cupressus sempervirens (Italian Cypress) : MaltaWildPlants.com - the online Flora of the Maltese Islands. Tree up to 30 m. Leaves 0·5-1 mm, dark green, obtuse. Male cone 4-8 mm; female 25-40 mm, ellipsoid-oblong (rarely globose), green when young and shining yellowish-grey when ripe, with 8-14 shortly and obtusely mucronate scales. Seeds 8-20 on each scale.